“Queens Vignettes” painted a portrait of the borough from the perspective of five Queens natives and residents. 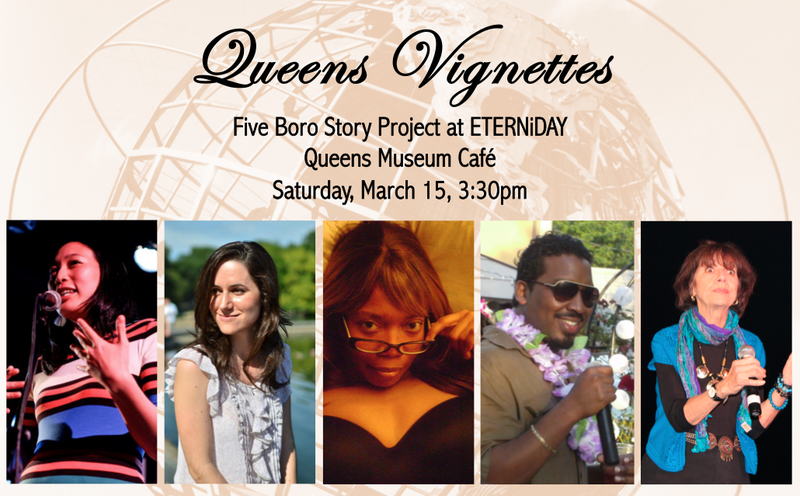 Queens Vignettes was part of ETERNiDAY, a day-long festival taking place throughout the Queens Museum from 12-8pm. Curated by the current poet laureate of Queens, Paolo Javier, this festival, named after a term coined by Flushing’s own Joseph Cornell, featured readings, book and printmaking workshops, panel discussions, musical performances, live film narrations and screenings, writing workshops, a publishers’ alley, and a closing reception recognizing festival honorees. Poets-in-the-galleries events throughout the day commemorated recent exhibits at the museum, as well as performances by the festival participants in select locations of the museum. Queens Vignettes joined “MEANWHILE, BACK IN QUEENS…”, a marathon showcase of local lit curated by Audrey Dimola. For the full ETERNiDAY schedule, CLICK HERE. For directions to the Queens Museum CLICK HERE.